Access to the new Water Quality Database is available here. 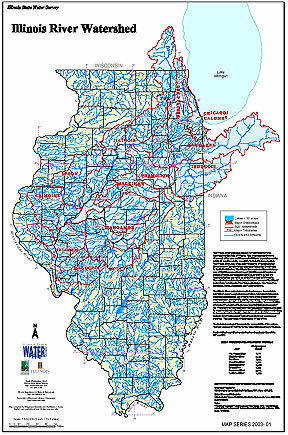 The ILRDSS web site is a portal to information related to the watersheds of Illinois. Our database of web links is organized and searchable by product type and geographic area. With more than 100 years of water protection between them, our speakers will share knowledge on past, present, and future actions. ILSAM produces statistical estimates of flow quantity in Illinois streams. A multi-phase water quality study of the Fox River watershed from Stratton Dam to the Illinois River confluence. Conference proceedings from 1987–2013 for this biennial conference on the management of the Illinois River and its watershed. Adobe Acrobat Reader is needed to view and print PDF documents available from our network. Poster-sized (26x38) map of the entire Illinois River Watershed. Part of the State Water Survey’s published Map Series (2003–1).